This post was sponsored by Cutting Edge Stencils. 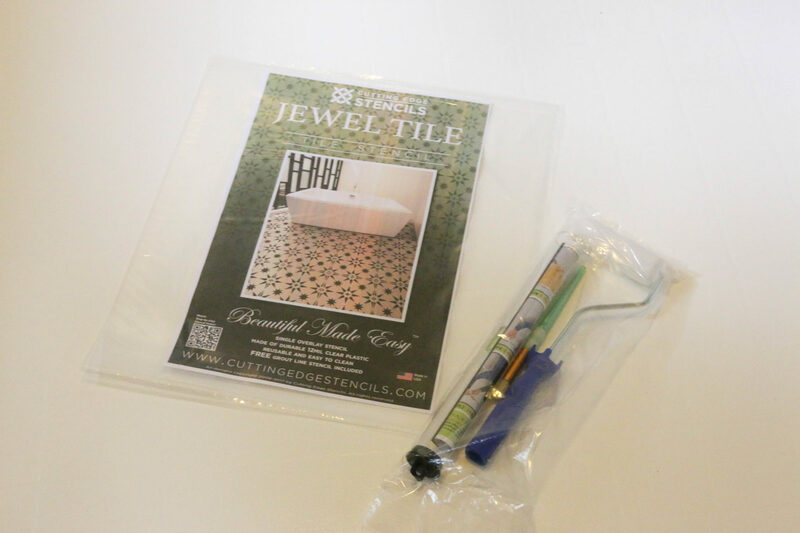 I received a stenciling kit from Cutting Edge Stencils. All opinions are my own. 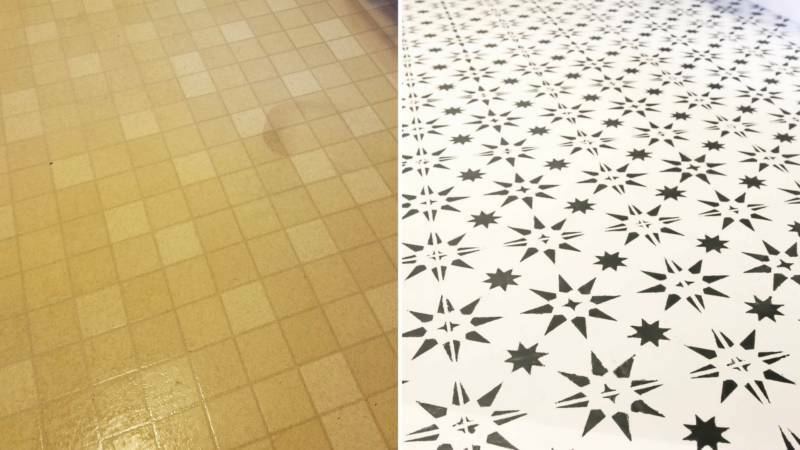 As part of the laundry room upgrading I started working on a few months back, I knew something had to be done with the old linoleum floor. It was in great shape (aside from the ugliness of course). 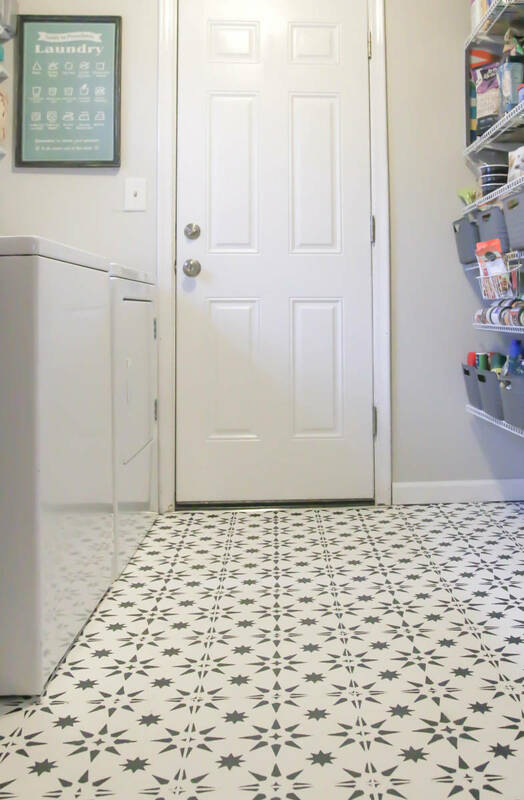 The same linoleum in this room was also throughout my kitchen, hallway and foyer at one point. 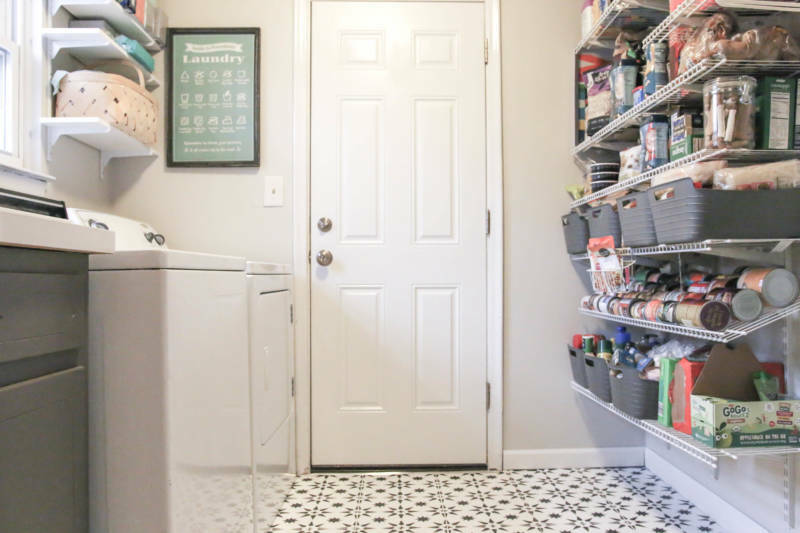 I considered installing a floating vinyl floor, but fell in love with the look of painted flooring that I had seen on Pinterest! 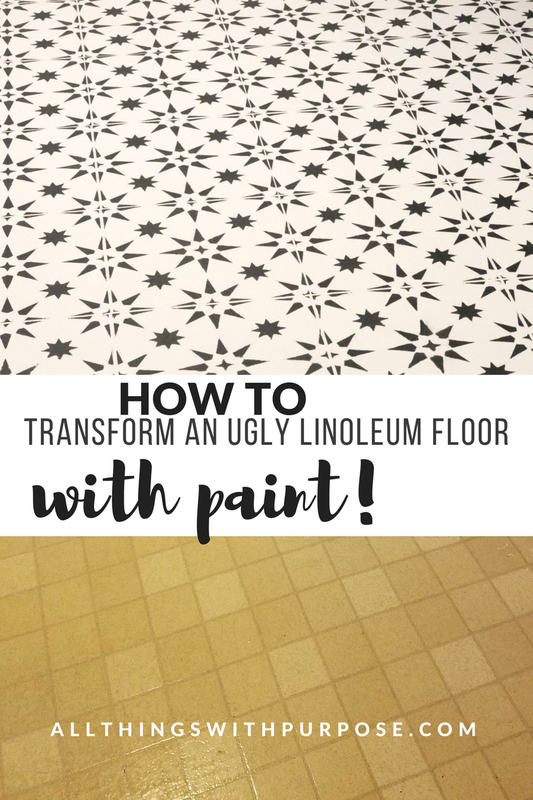 Cutting Edge stencils offered to send me a stencil kit to redo the floor and I jumped at the chance! 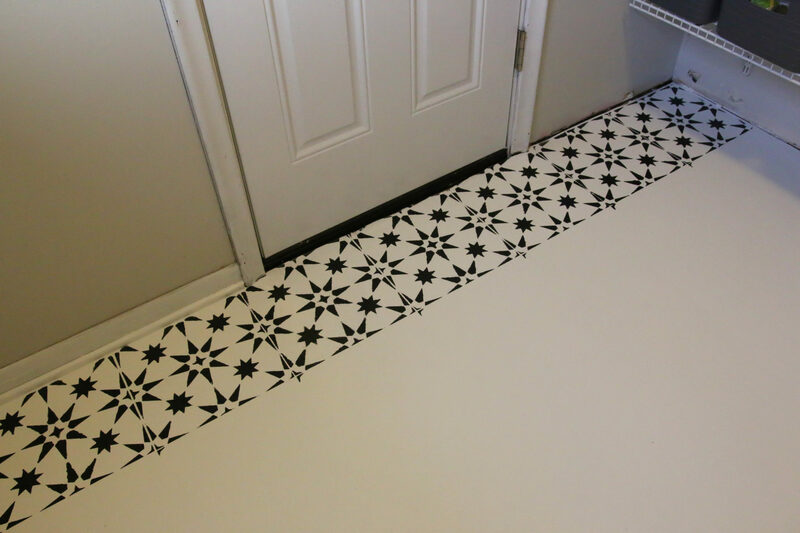 After a quick survey of other bloggers that had used stencils and paint to redo their floors, I decided on a Jeweled Tile floor stencil and used porch and floor paint to create the look. I vacuumed first, then scrubbed the floor really well with a degreaser. I then rinsed it with water and cleaned it with rubbing alcohol for good measure. I primed the floor with Stix Waterborne Primer using a regular, short nap roller. I allowed the primer to dry for the afternoon and then painted over it with a white, porch and floor paint. What I had read, was that using a porch and floor paint (meant to withstand heavy foot traffic) would hold up best in the long run. Others have used regular paint and top coated with polyurethane. I’m not really sure which one would hold up the best, but because I wanted a crisp, white base coat, I decided to steer clear of polyurethane which tends to yellow over time. Note: I have used water-based poly which is not supposed to yellow, but I really didn’t want to risk it. 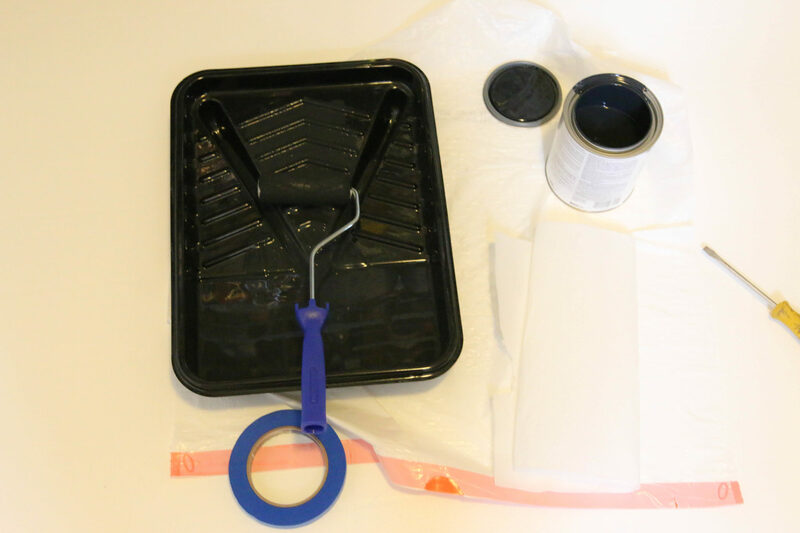 Before starting, gather all the supplies you will need: Small foam roller and tray, painters tape, tarp or garbage bags, paper towel, spray adhesive, hair dryer, damp cloth. 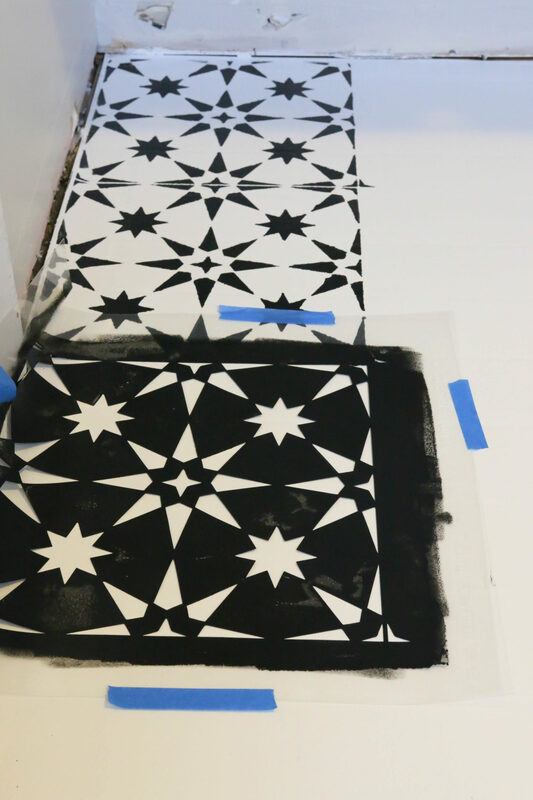 Position your stencil with the painters tape, but be careful with the adhesive! 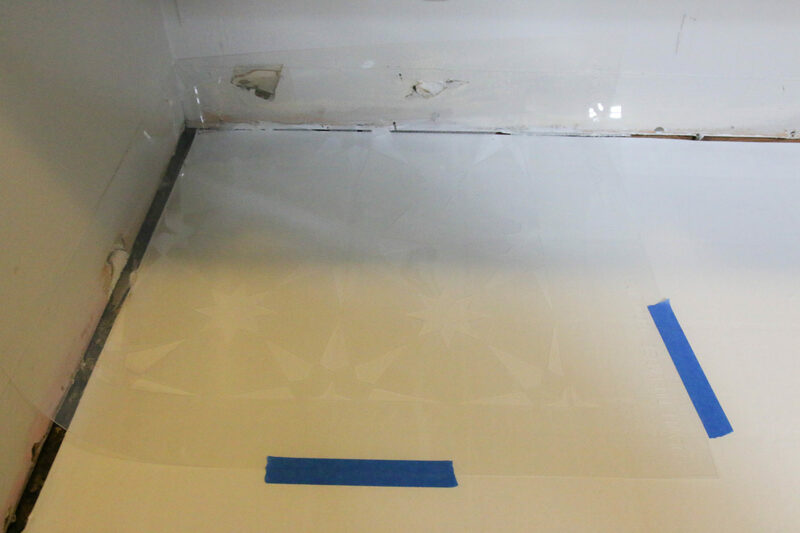 I had seen others use spray adhesive to keep the stencil in place for crisp, clean lines. I ended up using way too little or way too much. Too little, and the stencil still moved on me. Too much, and it stuck to the floor and left gummy goop in it’s path. I found that tape by it’s self did the trick. 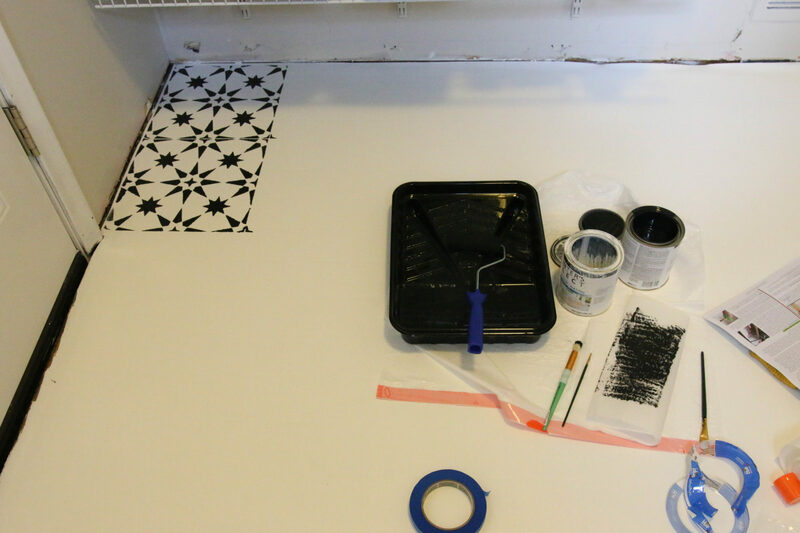 Dry your paint and stencil with a hair dryer to speed up the process! I did one entire row before I got smart and used a hair dryer. Without it, it would have taken me a couple days to finish this tiny room. Every time I painted one square, it took a good 5 minutes to air dry before painting the next one. Add that all up and it was way too long. 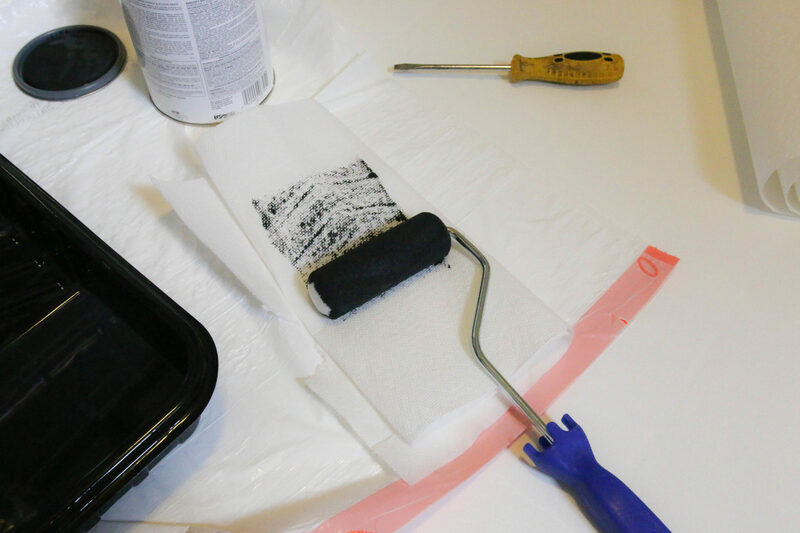 Gently roll your paint off onto a paper towel before painting the floor. 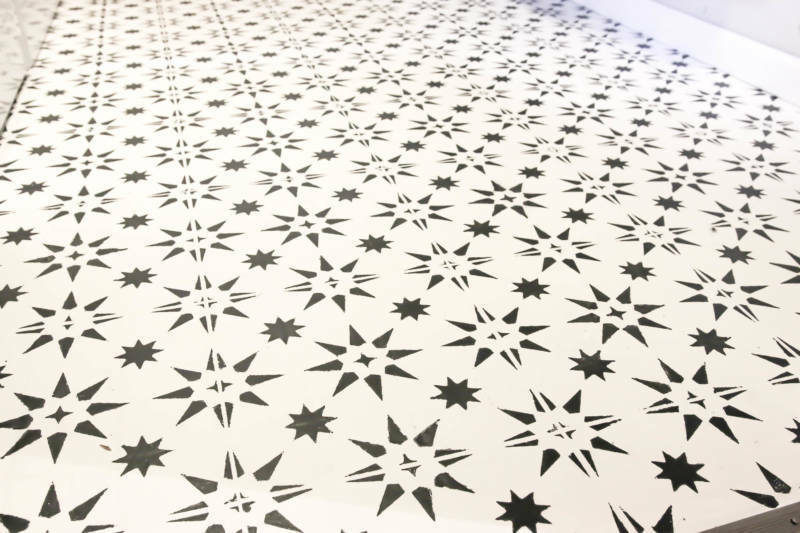 This will get off the big clumps and help the paint go on smoothly without bleeding through the edges of the stencil. When you find yourself being critical of your work and thinking everything looks sloppy, take a step back! Up close, I kept thinking my edges looked really sloppy, but in the grand scheme of things, you would hardly notice. Use a small artists brush to clean up big mistakes or messy lines, but don’t sweat the small stuff. It took me the whole afternoon to do this room and I couldn’t walk for a week, but it was so worth it!! Mental note: wear knee pads and sit on a pillow next time! Next Post: Our Atlantis Submarine Adventure! 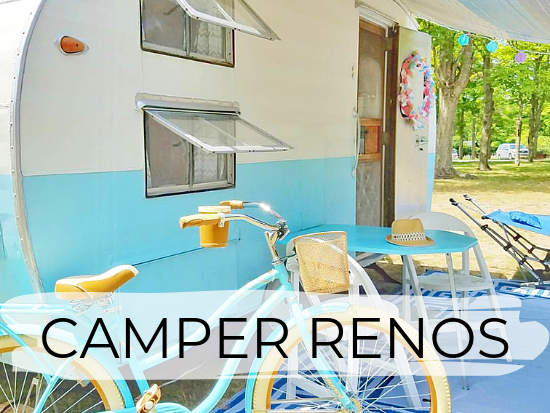 How is the paint holding up to wear and tear? 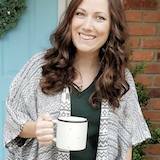 Hi Emily! It is holding up great!! I will try and do a follow up post to show updated pictures!